Armed suspected cult members desperate to free a detained member of their gang on Tuesday set ablaze the Oporoma Police Division in Southern Ijaw Local Government Area of Bayelsa. The cult member who was on Police wanted list for various crimes including kidnapping, sea robbery, armed robbery and acts of pipeline vandalism was being temporarily detained at the Oproma Division when his gang members struck to free him. Community sources in Southern Ijaw told The Nation that the timely reinforcement by security agencies deployed to protect oil facilities in the area saved the situation. 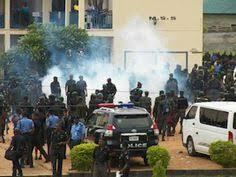 The Spokesman of the Police Command in Bayelsa, DSP Asinim Butswat, who confirmed the incident, said that a policeman on guard duty shot at the detained suspect to prevent his escape from lawful custody. “The suspect was arrested and detained at the Oporoma Police Division, Southern Ijaw Local Government Area, preparatory to being transferred to the State Criminal Investigation Intelligence Department (SCIID), Yenagoa. “The suspect on March 21, 2018 attempted to escape from lawful custody and was shot by the police officer on duty. “Other members of the suspected cult group mobilised and attacked officers on duty at the police division and set it ablaze. “Additional policemen were deployed to restore normalcy in the community. “There seems to be emergence of cases of cult activities in Bayelsa; we call on members of the public to volunteer useful information and to assist the police to tame the trend of cult activities amongst the youths in Bayelsa,” Butswat said. Reports have it that on Nov. 7, 2017, 10 suspected armed robbers and cult members that were detained by the Special Anti Robbery Squad cell (SARS) in Yenagoa broke free from detention and escaped.